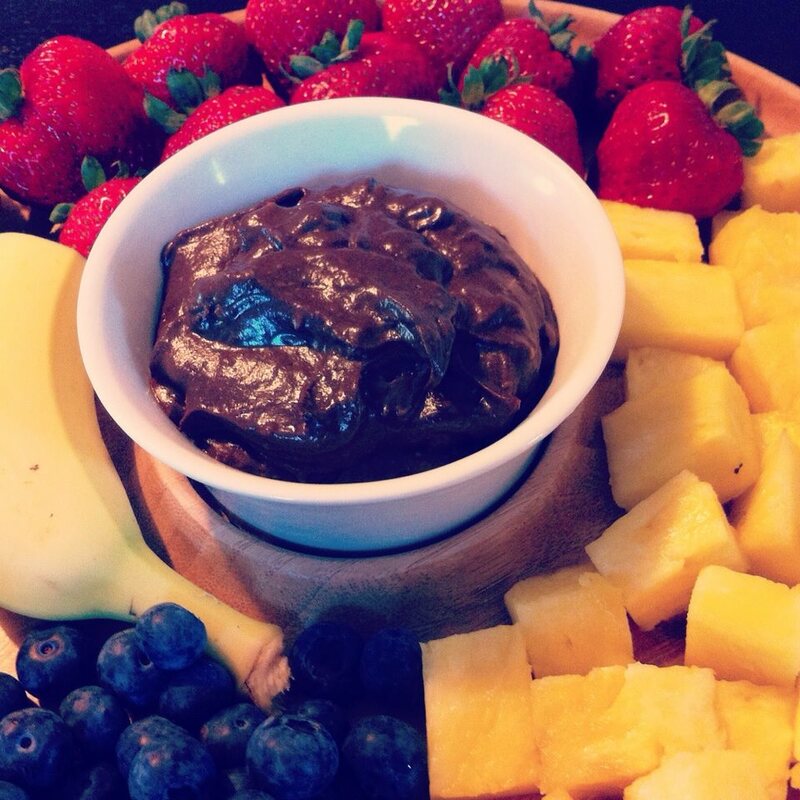 While I’m at the store, all the fruit looked amazing, so I decided on a chocolate avocado fruit dip that is absolutely delicious and gluten free, dairy free, and refined sugar free. I had made it a couple of times before at different events and it’s always a big hit. Sounds a little too good to be true, right? Well, it’s not! Read on. I gathered all the ingredients and only slightly sped home. I was able to make the fruit dip, chop up the fruit, and put it all on a tray in 15 minutes. So, not only is this dip healthy, but it’s fast and easy. It’s just plain awesome. Now, I should say I did not originally come up with this recipe, it was given to me by my friend, Amy (who probably found it somewhere on Pinterest), and I adapted it a little bit. If anyone knows where it originated from, please let me know and I’ll update this post to give them credit and a million thanks for this awesomeness. Here ya go! 1. Combine all the ingredients together in a medium sized bowl using an electric mixer, except the essential oil. Mix very well and try to get out as much avocado lumps as humanly possible. 2. Add one drop of essential oil at a time, adjusting to taste. 3. Serve alongside a plate of fruit or simply sneak a spoonful here and there when you want a treat. • The original recipe calls for coconut milk. I don’t usually have coconut milk handy unless I’m making my curry chicken, but that wasn’t on the menu this week. So, you can substitute any milk here: soy, almond, cow’s milk, or I have even replaced it with yogurt. • You want to mix the avocados really well or else you will have green lumps here and there. • You can make this dip without essential oils and it still tastes great, but I love it because citrus oils are known to be a mood uplifter. For more information on the only brand I trust to use internally, email ingo@amandagerber.com. What other essential oils do you think would go well in this dip? Let me know what ya think!